"I'll be frank. This is my fourth time here. I want to see my daughter. She lives in downtown Miami. If today I don't get what I want, I have a raft at home. I'll risk my life in the straits of death." Rarely does a movie generate as much emotion as a good documentary. Most likely this is because documentaries have the inherent advantage of narrative cinema: the depiction of real people living in the same world the viewer inhabits. I can't honestly recall the last time I felt as affected as I did while watching Balseros, which chronicles the journey of several Cuban citizens struggling to flee their island nation for Florida. The opening scenes of Cubans rallying in the streets of Havana against Fidel Castro's strict policy against emigration set the ensuing pieces in motion. In response to the overwhelming unrest against his policy, Castro lifts his ban and allows boats to leave for American shores. Most of us know that this act, made in 1994, did not last long and that the communist government of Cuba again discourages its citizens from leaving. Yet US and Cuban politics are secondary in this documentary—wait, scratch that, they're inconsequential. So is the promise of the American Dream or the oppression of Castro's regime. This is a documentary concerned with the humanity of its subjects. We are first introduced to Guillermo, a man whose wife and daughter left for America five years earlier. Experiencing multiple rejections for a visa, he and his son take their own raft and head to sea. Another couple, Juan Carlos and Misclaida, make their own raft by enlisting the services of others who can afford to buy parts with the promise of a spot on board. Misclaida's sister Méricys cannot afford passage, so she turns to prostitution as a means of raising the funds. However, her efforts are in vain, for she does not achieve enough money before migration is banned. Yet many Cubans, along with Guillermo, Juan Carlos, and Misclaida, do manage to leave, but are intercepted by the US Coast Guard and sent to Guantanamo Bay. Their living conditions are actually better at the military base than in Havana. The abovementioned individuals and many more are granted permission to enter the US. The specific relationships and events that happen cannot be conveyed in a review, but need to be seen with your own two eyes. Directors Carles Bosch and Josep M. Doménech chronicle the story of seven different balseros (the slang term given to those who flee Cuba for the US) and their families, beginning with their lives in Cuba to their initial year or so in the States. The approach to the filmmaking is rather effective, letting the characters speak in unscripted situations and following them through their daily lives. In fact, more important than what any of the people say is how they react to the news that is delivered to them. A surprising amount of time is devoted to watching the men and women portrayed here interact with others. Make no mistake about it, this is is not one of those "talking head" documentaries. By adapting a more subdued storytelling style, Bosch and Doménech create a striking depiction of life in Cuba and the costs of emigrating to America. It's amazing to see the determination of these people, who spare no time trying to learn English and find jobs. Not all of them are successful, as we learn when the filmmakers returned to each of their subjects in the year 2000, but some are. I don't want to spoil the stories for you, because watching Balseros without any knowledge about the specific events is like watching another human being's life develop before your eyes. It is touching, sad, humorous, inspiring, and frustrating. The truth conveyed here is so deep that it touched every bone in my body. The movie is 120 minutes long and I wish there were another 200 minutes for us to spend with these people. I'm reminded here of Elian Gonzalez, the little boy whose presence in Florida caused such a ruckus back in 2000. Like many people, that was merely a news story and of little interest to me. If for no other reason, Balseros is a must-see film because it shows that Elian was by no meansan isolated incident, and there's so much more to a person arriving from Cuba than the nightly news can possibly convey. Image Transfer Review: Presented in nonanamorphic 1.85:1 widescreen, the picture is quite gritty and washed out. It seems that the footage is being accurately represented in this transfer, though I am making a speculative guess about that. However, the look and feel of the documentary only help to add to its sense of realism. The English subtitles are burned into the picture, which contains a surprising amount of detail. My only major complaint here is that the transfer isn't anamorphic. Audio Transfer Review: The Dolby Stereo 2.0 mix is a relatively engaging listen, especially if you play it in ProLogic. Some effective rear-channel activity is consistently used here, particularly in the scenes set out at sea. Sound separation helps to open up the front sound stage, making a surprisingly engrossing audio experience. Gallery—a photo gallery of image from the documentary. Timeline of Cuban Migration—text chart of Cuban migration to the U.S. and migration policies since 1960 until 1995. Extras Review: The supplemental material here feels gratuitous to me, apart from the biographies of directors Carles Bosch and Josep M. Doménech. The text for each man is fairly brief but gives some insight into their other accomplishments. There's also a gallery of still photos, most of which seem to be featured in the finished documentary. Finally there's a Timeline of Cuban Migration, which provides text of the major events involving Cuba and the US on the issue of migration. It's a fairly brief history lesson, but could be of interest to those unfamiliar with the history. However, much of what is covered is also referenced in part (or can be inferred) from the documentary. 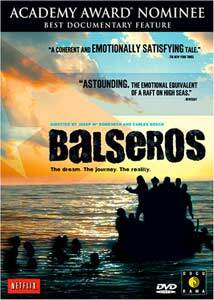 A gripping documentary, Balseros is one of the most emotionally charged movies you'll ever see. Do not hesitate to pick up this DVD from Docurama, which offers an adequate presentation of this tremendous story with some extra features to boot.